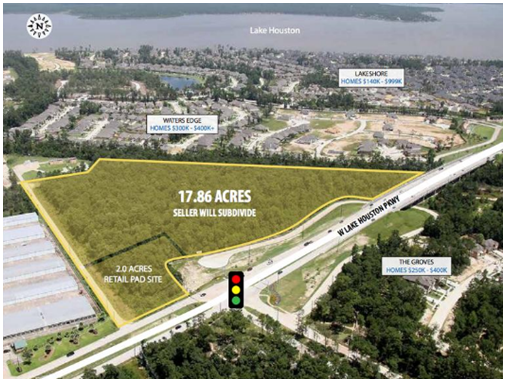 ​HOUSTON – A 17.9-acre site off West Lake Houston Pkwy. has been acquired by Martin Fein Interests Ltd., who plans a luxury apartment project near Lake Houston. The deal closed January 10, 2017. The multifamily developer plans to build a three-story garden-style apartment complex spanning about 300 units on the site, which sits a few miles north of Generation Park and is zoned to Humble Independent School District. Martin Fein Interests is expected to break ground on the yet-to-be-announced project later in 2017. The new Fein apartments will rise near Generation Park, a massive mixed-use project, which is spurring a new wave of residential development in the West Lake Houston area northeast of Houston. ​​​Want more data? See Houston Multifamily Market Research​.